How to improve your TV's sound | What Hi-Fi? The laws of physics are cruel mistresses. It is they who keep your television’s audio quality at its current inadequate standard. Current flatscreen TVs, with their sleek and slim profiles, simply don't have the enclosure space necessary to allow drivers to give you big, punchy sound for big action films, or the detail needed for dialogue-heavy shows. Most TVs place their speakers at the bottom of the screen, firing downwards – hardly the best way to get really satisfying, impactful sound. While some sets, such as Sony's A1 and AF9 OLED TVs, have managed to incorporate speaker technology that deliver decent sound, and others like the Panasonic TX-55FZ952B and Philips OLED+ 903 feature built-in soundbars, the majority of TVs still emit wispy, tinny sound that doesn't do justice when accompanying the gorgeous 4K HDR picture you're seeing. So what are the best ways to improve your telly’s sound? Here are five different options that will instantly enhance your TV-watching experience. This is the most affordable way of improving your TV’s sound, and also the most versatile. Desktop speakers are relatively small, and can quite easily be placed close to your TV even when you have next-to-no space. We’d recommend something like the five-star Ruark Audio MR1 Mk2s, which are engaging, capable speakers. Thanks to an optical input on the back of the master speaker, they can easily be connected to your TV. You can also opt for the talented KEF LSX wireless system, which is packed with streaming features and multiple connections, and have the bonus of not needing a cable to connect the two speakers. If your favourite wireless speakers don’t have an optical input, you can always take the 3.5mm headphone out from your TV and plug that into your speakers’ auxiliary input. This way, you can let the TV control the volume, too. If you’ve already spent a lot of care and cash on a good pair of stereo speakers and a stereo amplifier, it makes perfect sense to connect up your TV and enjoy a considerable step up in audio performance. Plenty of integrated stereo amplifiers, such as the Audiolab 6000A and Cambridge CXA60, have optical inputs to take your TV’s audio output and deliver it to your speakers. If you have a purely analogue amplifier, like the Award-winning Rega Brio, you can use the amp’s RCA inputs and plug them into your TV’s corresponding outputs. Make sure you check your TV does have analogue audio outputs, though, as newer TVs don’t always have this kind of legacy connectivity. Alternatively, you can use an external DAC such as the Arcam irDAC II to take an optical signal. The final step is to go into your television’s menu settings and ensure that it’s directing the sound output to your hi-fi system, not its own speakers. Top tip: want more oomph in explosive scenes? Add a separate subwoofer to your hi-fi set up to create a 2.1 system. If you don’t have the space or budget for a traditional hi-fi or AV system, but still want to experience better sound from your TV, a soundbar or soundbase might just be the solution you’re looking for. Most soundbars are slim enough to be propped in front of your TV on the stand (or positioned directly under your wall-mounted TV). 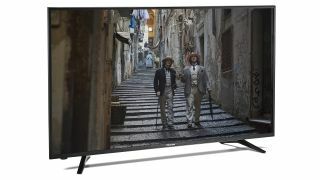 Some bars, like the superb Dali Kubik One or the chunky Yamaha YSP-5600, are quite tall, so watch out the height of the bar doesn’t obstruct the IR sensor at the bottom edge of your TV. Soundbases simply offer an alternative configuration – the flat base means you can place your TV right on top of it, or simply slide it into your TV rack. The bigger cabinet means you get a bigger, bassier sound than a soundbar (the latter of which often come with a separate subwoofer for that extra low-end reach). While plenty of first-gen soundbars and bases – the Dali and the Q Acoustics Media 4, for instance – only offer optical inputs, newer products such as the Dolby Atmos-enabled Sony ST-HT5000, the Yamaha YAS-207 and the Sonos Beam include HDMI connections. Some, such as the Sonos Playbase, also offer plenty of streaming features for the likes of Spotify and Tidal, while the Beam adds voice assistants such as Alexa and Siri to its long list of features. When it comes to connectivity, optical is simplest - and it can handle up to 5.1 Dolby Digital soundtracks. But it doesn't have the bandwidth necessary to carry lossless Dolby TrueHD or DTS-HD Master Audio soundtracks. HDMI does, although we wouldn’t expect an entirely faithful 5.1 sound from a soundbar. Yamaha’s YSP range of soundbars, which reflect discrete channels in a convincing way, comes closest. Stereo is nice, but surround-sound is way better – especially if you’re after an immersive cinema experience in your own home. A talented AV receiver and a mighty surround speaker package will deliver the scale, detail and immersion you want when watching your favourite films and shows. It’s the ultimate boost to your TV’s weedy sound. Considering your Blu-rays, and Netflix and Amazon Prime Video streams, output 5.1 Dolby/DTS soundtracks as standard, it makes perfect sense to invest in a 5.1 surround system if you really want the best sound to complement your pictures. You can also expand to a 7.1-channel set-up, or full Dolby Atmos system with speakers in the ceiling at a later date if you want, too. Yes, this is a costly option. And you’ll have to commit a lot of floor-space to kit and cables. But you don’t have to cash in your life’s savings to get a decent home cinema system started. Combine the Award-winning Dali Zensor 1 5.1 or the Q Acoustics 3050i 5.1 Cinema Pack speaker package with the superb Sony STR-DN1080 receiver and Sony UBP-X700 4K Blu-ray player, and you won't break the bank. Sometimes, getting better audio doesn’t mean turning the volume up to 11 or setting up huge speakers all around your room. Sometimes all it takes is a good pair of headphones. You may live with someone who doesn't much care for football, after all. If you have a decent pair of home headphones, such as those from Grado or Beyerdynamic, they most likely come with a 3m cable. That should be long enough to plug into the back of your TV (if not, you can get cable extenders). But the convenience of Bluetooth headphones can’t be understated. A lot of TV manufacturers (such as LG, Sony and Samsung) offer Bluetooth pairing from their TVs. They connect to your headphones just as they would with your smartphone. Headphones, by their very design, offer a more intimate listening experience. It’s more personal, you might arguably hear more detail, and they're undoubtedly immersive - perfect for your Game of Thrones binge. Invest in a good Bluetooth pair, such as the Award-winning Sony WH-1000XM3 or B&W PX wireless cans, and you'll be well on your way.